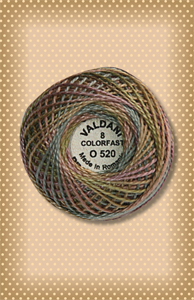 Nutmeg Hare would like to share this beautiful Valdani thread with you! So gorgeous, yet subtle with vintage shades of dusty mint, dusty rose, and pale blue..I want to stitch the day away with this size 8 hand- overdyed perle cotton. Simply Lovely and Shabby Chic! 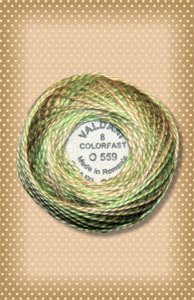 Nutmeg Hare has some new Valdani threads to share with you...All because collecting beautiful colors is such a passion. 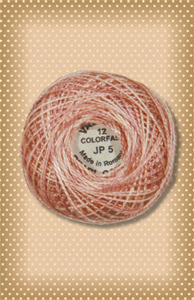 This size 8 hand- overdyed perle cotton is a wonderful and versatile choice for your stitching projects. Subtle variegated shades of light to golden greens are giving me inspiration for a stitching project. At Nutmeg Hare, one can never have enough floss and perle cotton colors to choose from and Watery Weed is a welcome addition. There is beauty in a rose and then there is THE beauty in "Nantucket Rose". Valdani 's hand overdyed perle cotton thread collection offers a wonderful variety of lovely colors, and collecting them all is the ideal goal. The variegated shades of size 12 " Nantucket Rose" lean toward an apricot rose hue, with light and dark tones in the same color family. 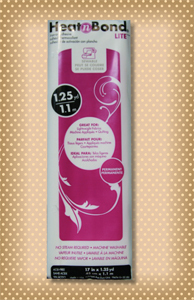 Welcome this thread of softness and beauty..."Nantucket Rose" is lovely. 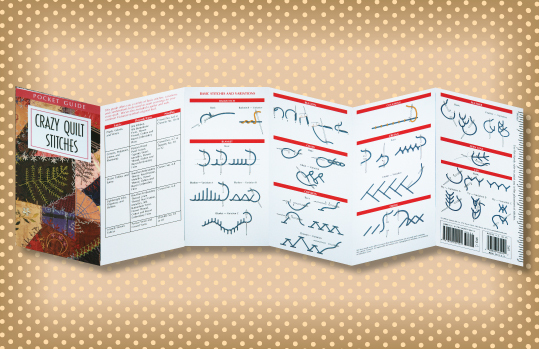 Nutmeg Hare Gift Certificates...The ideal gift for friends, family, and avid stitchers. a Nutmeg Hare gift certificate can be easily redeemed. In fact, when presented with such a certificate, it may be hard to decide just what to choose. Packaged in the same special Nutmeg Hare style with a coordinating envelope, the certificates are available in various dollar amounts. As the purchaser, it will be sent to your mailbox, allowing you to wrap and personally deliver it to that special person. To redeem gift certificates, phone Nutmeg Hare directly at 425-760-7605 and place your order. Have fun Shopping!